You Want ME to Race? Sure! As the new owner of a Laser, you've probably already experienced the speed, acceleration, and handling that this boat is famous for. Being a one-design (matched to other boats of its type) it is also an outstanding racing machine. But I've never raced before! That's okay - The Laser provides a superb way to get started in the exciting and fun sport of sailboat racing. First of all, its hard to find a nicer and more helpful group of people to get you started than Laser racers. At every race, you'll find plenty of willing hands to help you get your boat off of your car roof, and to get it rigged. But the racing rules are complicated, and I don't want to crash into anyone. That's right. Three basic rules should keep you out of trouble on your first race day. Rule 1. The boat with the wind over its right side has the right of way. 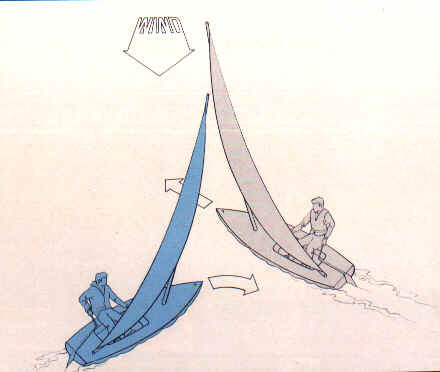 In the diagram, the boat on the right (gray) has the right of way. What should the blue boat do? That skipper can turn to the right (downwind) or tack. The only trick is to plan early, so that the course change is small, or the tack is unhurried. It helps to put some green tape on the right side of your boom. If you're sailing along and looking at the tape, you are on starboard tack, and you have the right of way. Rule 2. The downwind (leeward) boat has the right of way. 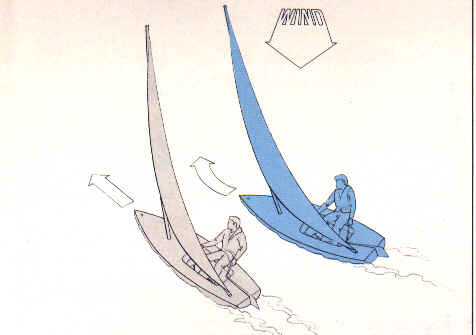 When the boats have the wind on the same side, the downwind (gray) boat has the right of way. Rule 3. At a turning mark, the boat on the inside has the right of way. Here, the outside boat (blue) must give the gray boat room to go around the mark. Finally, when in doubt, just stay out of the way! Simple as that! What about the starting line? Glad you asked. The textbooks on racing tell all about how to muscle in on that crowded starting line. Since this is your first race, and its very unlikely you will come in first (you do have to pay your dues, after all) start in the second (or third) row! The race committee will provide a countdown, with a logical sequence of horn or whistle signals. This will be explained at the skipper's meeting. Most of the fleet will line up along the line, on starboard tack (wind over right side) toward the end of the time sequence. Sail a parallel course to these boats, but a boatlength or so downwind. This will keep you out of trouble! Do this a few times, you'll quickly gain confidence and be ready to use more aggressive starting techniques. And, most likely, after the start you'll be near the back of the fleet, so you won't have to worry about right-of -way rules. Don't worry, because with experience, as you move up through the fleet, the rules will become more logical and easier to apply. When you reach this point, start reading that rule book! Racecourses sound complicated. How will I know which way to go? The courses that the race committee plans to use will be explained at the skipper's meeting. But also keep in mind, you're not going to beat the hotshots on your first time out, so you should be able to have someone to follow. It sounds like I won't score well my first time out. What will the other racers think of me? First of all, everyone on the racecourse, at one time or another, was a beginner. But, just like in golf or tennis, you will find all levels of experience represented in the sport. You're likely to find other racers on their first race, which will give you some competition to have fun with. The experts are usually eager to give advice - before, during, and after the race. Also, everyone is happy to see new sailors joining the sport. The more boats on the racecourse, the more fun it is for everyone. And remember, while you also have a learning curve in golf or tennis, most of us never get to play directly with the top people in the sport. The Laser, being an Olympic class, attracts some of the world's best sailors. You may just find yourself on the racecourse with one or two of them! 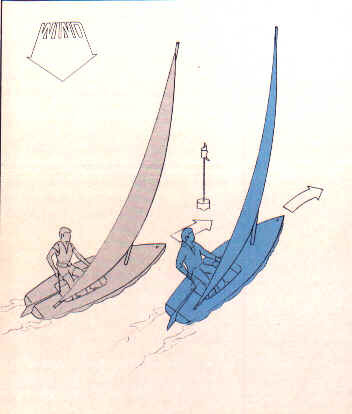 The skills of sailboat racing, like sailing in general, can be picked up in an afternoon, but pursued for a lifetime.